I'd never been committed (disciplined?) enough to carry around a sketchbook with me at all times, and I'd also amassed a rather large collection of moleskins and notebooks of all shapes and sizes, and never had all my ideas in one place. I was hoping that the smaller form factor of the iPad mini would help -- and I was actually surprised how much of my work could be done on the mini, especially when traveling or running around the office, etc. With my background, I was also already quite familiar with many different mobile apps - like Adobe's Ideas and Photoshop Touch, like AutoDesk's SketchBook Pro, and various other apps. I tried most of them. They were "ok". These apps were also sophisticated (layers, vectors, tools, commands, multi-finger gestures, etc), and as such, required thought. What I was really looking for was a tool to quickly capture ideas. I stumbled upon an app called Paper, by a company called FiftyThree. And I fell in love with it. It's simple. No layers, no complexity. 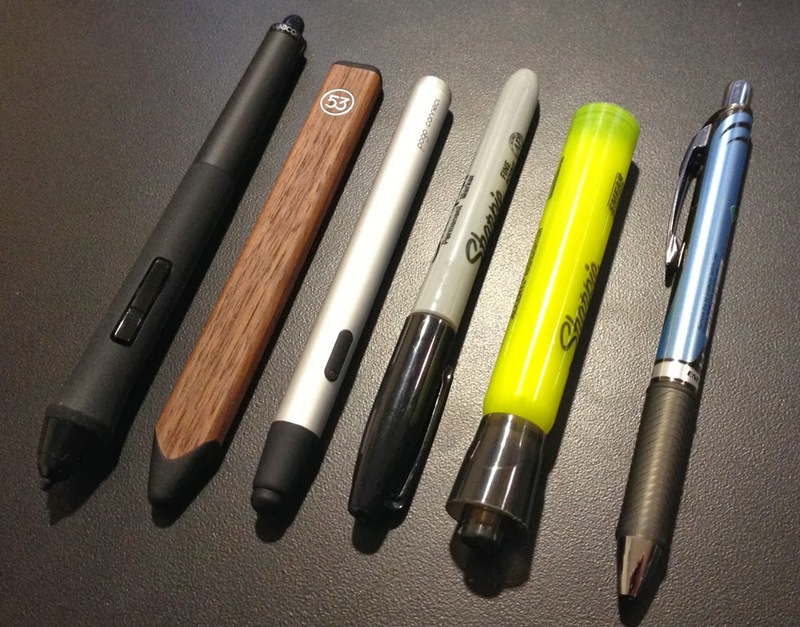 No technical tools -- just plain tools I'd find on my desktop -- a pencil, a pen, a marker, a watercolor brush, etc. There's a very basic zooming feature, but ultimately, you have just the screen to work with. What you see is what you get. No zooming in and out, no panning. Just capturing ideas quickly. The tools feel right. The Pencil draws like a pencil should. It works as I would expect. Light lines, that get darker as I work with them. There's no pressure sensitivity, but line weight is adjusted based on speed, which feels very natural. It organizes my thoughts. This is bigger than I can express. I juggle multiple ideas -- constantly. All other apps work with the same traditional computer-based file system. I can save my files, and if I wanted to, I could create folders. But in reality, it's a mess. There are no files with Paper. You create notebooks -- little moleskins -- and you can have unlimited pages in each notebook. I create a dedicated notebook for each project I'm working on, and it's easy iterate on ideas within a project, or to move from one project to the next. So I love Paper. It's fantastic. But I was getting tired of using my finger. And thus, I began the search for a stylus to use with my iPad mini. I've tried many. Most disappointed me. I finally settled on the Pogo Connect. I wasn't happy with it, but it was the best I could seem to find. 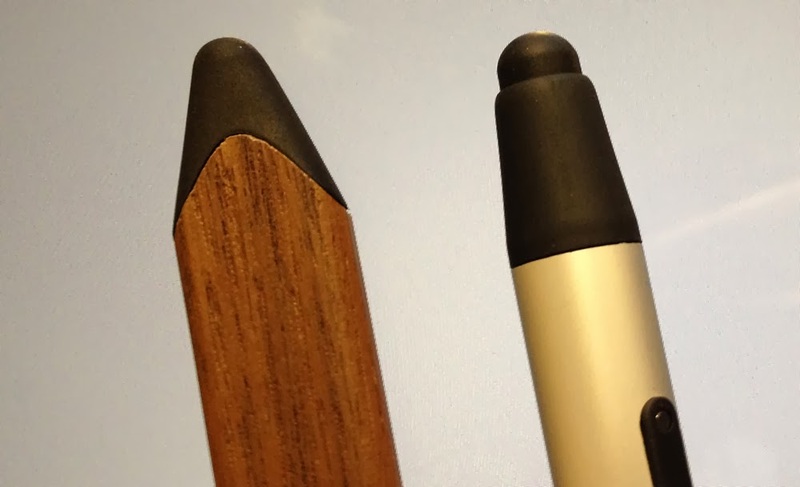 About a month ago, FiftyThree announced Pencil - a stylus that had some pretty cool features built into it. Since I loved Paper so much, I decided to order Pencil. Today, Pencil arrived, and I'd like to share my experience with it. 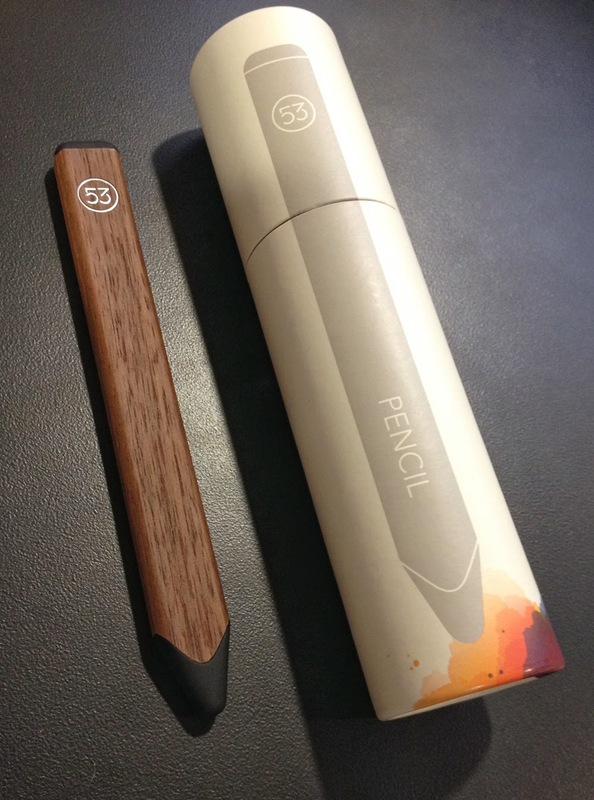 Ok, here's some more detail: Pencil comes in a lovely package. 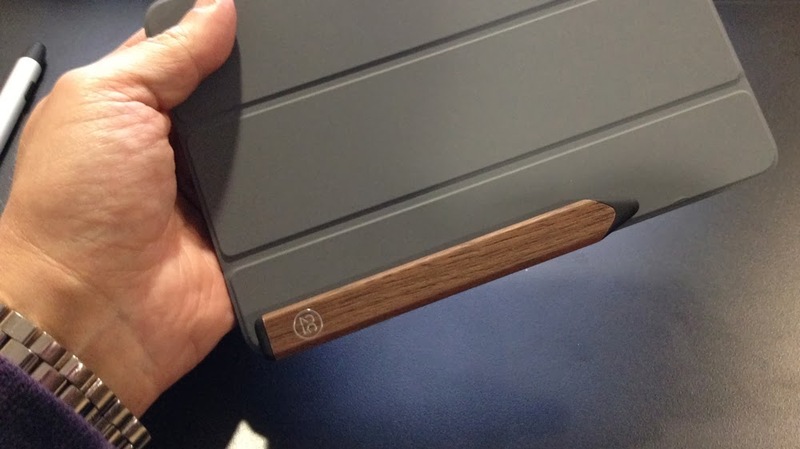 I ordered the Walnut finish. It feels REALLY nice in your hand. The shape is flat, not round. Weighted a bit more towards the front, it's a bit heavier than the pogo connect. You cannot compare the feel to the connect. It's not even in the same vicinity. 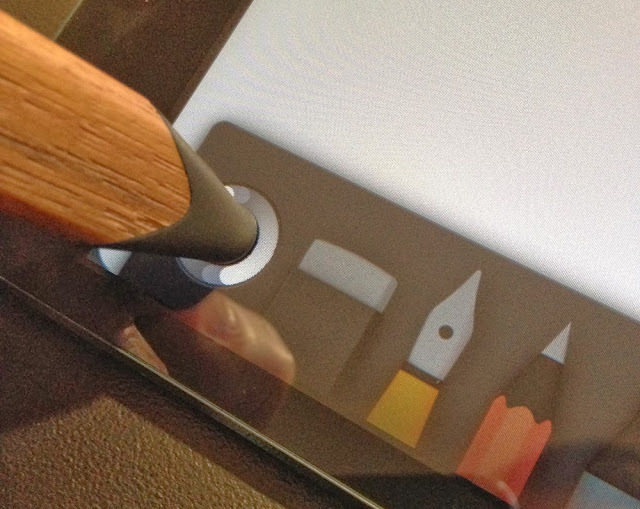 To activate Pencil, you tap on the Pencil icon in the Paper app. It's easy. FiftyThree also recommends that you turn off the multitasking gestures features on the iPad (I highly recommend you follow their recommendation). When you're using Pencil within the Paper app, you get some pretty rad functionality. Palm rejection is by far the best. I can finally rest my hand against the screen and draw at the same time. It's comfortable and sooo nice. When using Pencil, you can set your finger to "blur" which in effect is like smudging with pastels. Also a really cool feature. Of course, Pencil also has an eraser - just flip it over. After doing that so long with my Wacom pen and tablet, it's nice to see that here as well. I'm pretty picky about the tip of a stylus. For the life of me, I can't understand why the tips of a stylus always need to be soft mushy rubbery blob. It's one of the things I really didn't like about the pogo. Pencil's nib is more contoured, although it still has the mushy thing happening. That being said, there's a point within the rubbery mass that gives you some nice feedback as you draw. If I had any criticism for Pencil, it's the nib. Don't get me wrong -- it's still far better than anything else I've tried to date. My Wacom Art Pen on my Intuos tablet though (with the different nibs) still reigns supreme as a digital pen goes. Speaking of other pens, in case you're curious, here's how Pencil looks compared to the other tools I use on a daily basis. Finally, Pencil has a magnetic contact in it, which snaps to the magnetic contacts on Apple's smart covers. I never have to worry about carrying Pencil around -- it's always there. While it's true that some of Pencil's features (i.e. palm rejection) only work when using the Paper app, I still find that with the magnet and the superior feel it offers, Pencil is still my preferred stylus no matter what app I decide to use. Adobe is working pretty hard on a stylus too -- called Mighty. Adobe previewed it at the last Adobe MAX conference, and it promises to have some pretty cool features. But after playing with Pencil, what impresses me most is how much it mimics a real pencil. Simplicity and feel. For now, Pencil is my new best friend. Interesting stuff, thanks for the review. 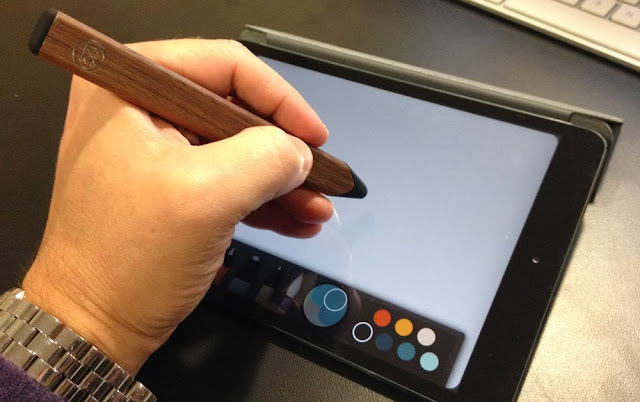 I'm still waiting for one of these guys to get pen tilt working with a tablet app. When I'm working in photoshop and painter I use it all the time. Can you export a notebook once it's full, into like a pdf or an archive or something--so that you don't have a billion stored away on your tablet? Yes, you can export a notebook entirely as a PDF and email it or send it to another app on your iPad (i.e. Acrobat). Paper also has a service called "Book" where you can export your notebook and get it back as a beautifully printed and bound picture book. Good stuff. Thanks for the review.